Taco Madness: This Saturday, Grand Park LA will become home to some of LA&apos;s best taqueros, including Mexicali Taco & Co., Mariscos Jalisco, Leo’s Taco Truck, Yuca’s, MexiKosher, Tacos Punta Cabras, Guerrilla Tacos, Jalisco Mobile Taco Grill, and Frida’s Taqueria. They&apos;ve all been competing in L.A. TACO&apos;s epic Taco Madness competition for the past few weeks, and the winner will finally be announced in the park. There&apos;ll also be live music, a live mural drawing, and a beer garden hosted by Cerveza Indio with La Cita. The event is free, and you can find out more details here. 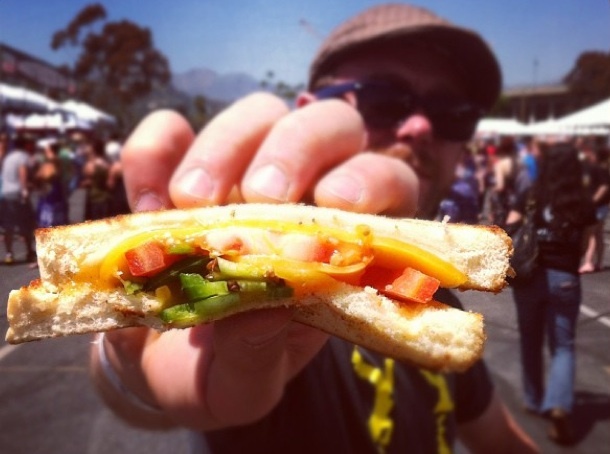 Grilled Cheese Invitational:Lovers of bread and cheese can revel in the melty mayhem at the 11th Annual Grilled Cheese Invitational this Saturday at Los Angeles Center Studios on 4/20 from 11 a.m. to 6 p.m. For more info and tickets, you can visit their site here. Bites and Sips at Ciclavia: This Sunday&apos;s Ciclavia flows right past Bigfoot West and Oldfields Liquor Room, and in honor of the bike fest, both bars will open at noon. Cyclers can take a break and enjoy $1 tacos, $5 cocktails and specialty mock cocktails like Bigfoot West&apos;s The Tired Peach made with fresh muddled peaches, simple syrup, lemon juice topped with housemade ginger beer. The deals last until 4 p.m.